Meyer during the 2017 season. Meyer was born on July 10, 1964 in Toledo, Ohio, and grew up in Ashtabula, Ohio. He graduated from Ashtabula's Saint John High School in 1982. Meyer was also selected in the 13th round, as a shortstop, by the Atlanta Braves in the 1982 Major League Baseball Draft. Meyer spent two seasons playing minor league baseball in the Braves organization. He concurrently played defensive back at the University of Cincinnati before earning his bachelor's degree in psychology in 1986. During his undergraduate studies, Meyer was a member of Sigma Chi Fraternity (Zeta Psi Chapter). Meyer went on to earn his master's degree in sports administration from Ohio State University. In 2004, Meyer was recognized as the college football coach of the year by both sportswriters (Eddie Robinson Coach of the Year) and television commentators (Home Depot Coach of the Year Award). He has twenty years of college coaching experience, including nine as a head coach. His overall record as a head coach through the end of the 2009 season is 96–18, and he is 49–14 in conference play. His winning percentage (.842) through the end of 2009 season ranks first nationally among active college football head coaches. Meyer is a devout Roman Catholic and on several occasions has referred to the head coaching position at the University of Notre Dame as his "dream job," leading to speculation that he would someday wish to coach there. However, according to a July 2009 newspaper report, Meyer insisted he would never leave Florida for Notre Dame. And when the employment status of Irish coach Charlie Weis came into question in November 2009, Meyer held a press conference to dispel rumors linking him to the possible opening, stating that he would remain at Florida for "as long as they'll have me." The University of Cincinnati's Brian Kelly was eventually hired for the job. On December 26, 2009, Meyer announced he would resign following the team's bowl game against Cincinnati, citing health concerns. However, the following day Meyer announced that he would instead take an indefinite leave of absence, and he resumed his coaching duties in time for the beginning of the Gators' spring practice on March 17, 2010. Florida athletic director Jeremy Foley announced Meyer's resignation on December 8, 2010, but stated that Meyer would remain as the head coach through the Gators' appearance in the Outback Bowl on January 1, 2011. On November 28, 2011, Meyer accepted the head coach position at The Ohio State University. After playing as a defensive back and placeholder for the University of Cincinnati, Meyer spent one season interning as a defensive back coach at Saint Xavier High School in Cincinnati, Ohio in 1985 under the mentorship of legendary St. Xavier head coach Steve Rasso, where he met members of the Ohio State coaching staff. His first collegiate coaching position was a two-year stint as a graduate assistant coaching tight ends at Ohio State under head coach Earle Bruce. He spent the next thirteen years as an assistant—two at Illinois State, six at Colorado State, and five at Notre Dame. One of the talents he coached at Colorado State was WR Greg Primus (3,096 yards and 17 TD in 3 years). He put up over 1,000 yards receiving from 1990–1992 under Meyer's tutelage. At Notre Dame, he coached WR Bobby Brown who would finish his career with 1,521 yards and 12 TD receiving. In 2000 at Notre Dame he coached WR David Givens who would later be drafted by the New England Patriots. In 1990, while still the linebacker coach at Illinois State, he called Toledo head coach Nick Saban's home and spoke to Saban's wife to inquire if a position was available. Saban, however, never returned the call. Saban later said "I was so kind of caught up and busy with what I was doing, I never really followed up on that. Obviously, that was a huge mistake on my part because the guy's a fantastic coach." In 2001, Meyer took his first head coaching job at Bowling Green. In his first season there, he engineered one of the greatest turnarounds in the NCAA football history, going 8–3 and capping off the season with a 56–21 victory over Bowling Green's rival, the University of Toledo Rockets. He also earned Mid-American Conference coach of the year honors. The next year, Bowling Green finished with a 9–3 record. After a 17–6 overall record, Meyer left for the University of Utah. He helped turn around a team that had gone 2–9 in 2000 in large part due to QB Josh Harris, a player tailor-made for Meyer's scheme. In part-time play in 2001, Harris passed for 1,022 yards with 9 touchdowns, and ran for 600 yards and 8 touchdowns. The next year, he passed for 2,425 yards with 19 TD and ran for 737 yards with 20 TD. Meyer would later use such quarterbacks as Alex Smith and Tim Tebow in a fashion similar to the way Meyer used Harris. After two seasons at Bowling Green, he took the job at Utah in 2003. In his first year there, Meyer was named the Mountain West Conference's Coach of the Year with a 10–2 record, the best ever for a coach's first season at Utah. He also earned honors as The Sporting News National Coach of the Year, the first Utes coach to do so. They also won the program's first outright conference championship since the 1957 team won the Skyline Conference title. Meyer's success can be attributed to his unique offensive system, which is an offshoot of Bill Walsh's West Coast Offense, relying on short pass routes. Meyer's base offense spreads three receivers and puts the quarterback in shotgun formation. Then, he introduces motion in the backfield and turns it into an option attack, adding elements of the traditional run-oriented option offense. In 2004, Meyer led the undefeated Utes to a Bowl Championship Series bid, something that had not been done by a team from a non-automatically qualifying BCS conference since the formation of the BCS in 1998. He remained at Utah long enough to coach the team to a Fiesta Bowl win over Pittsburgh, capping off the Utes' first perfect season (12–0) since 1930. In 2003, Utes quarterback Alex Smith threw for 2,247 yards and 15 touchdowns and ran for 452 yards with five touchdowns. In 2004, he threw for 2,952 yards with 32 touchdowns and ran for 631 yards and 10 touchdowns. His production in Meyer's offensive scheme was a large reason why Smith was considered a first-round pick entering the 2005 NFL Draft. In the wake of his accomplishments at Utah, both the University of Florida and the University of Notre Dame vied for his services. Meyer chose to become Florida's head coach for the 2005 season, signing a seven-year contract worth $14 million. He later signed a six-year contract extension with the Gators on June 7, 2007; the extended contract paid an average of $3.25 million per year. On August 3, 2009, Meyer received another contract extension that made him the SEC's highest paid coach during the 2009 season; his 2009 extension was worth $24 million over six years. At the time of the latest contract extension, Meyer was the third highest paid college football coach, behind only Pete Carroll and Charlie Weis. Meyer has been criticized by some commentators because 31 of his players were arrested during his nearly six years as the Gators' coach. The seriousness of the charges varied widely, from minor offenses such as possession of alcohol by a minor to the charges of possession of a concealed weapon, "aggravated stalking, domestic violence by strangulation, aggravated assault, burglary, larceny and fraudulent use of credit cards." Many of the charges were ultimately dismissed. Meyer's punishments also varied with the severity of the charges, with some players missing no game time and others being expelled from the team. In September 2010, after Gator receiver Chris Rainey was arrested for sending a threatening text message to a former girlfriend, Meyer stated that he was "real upset about that. After a while, enough's enough. If there's something that we can improve on, we're certainly looking into that. It's like if our graduation rate stinks then we gotta improve that. If there's other issues in a program, that's our job to get it better. It's people making stupid mistakes, that's something we gotta correct." In 2005, his first season at Florida, Meyer's Gators team finished the season 9–3 (5–3 in the Southeastern Conference). The season included an undefeated record at home and a bowl victory against Iowa in the Outback Bowl in Tampa, Florida. The Gators would have faced LSU in the SEC Championship Game, but they lost to South Carolina and former Florida head coach Steve Spurrier in the SEC regular season finale. In 2006, Meyer coached the Gators to a 13–1 (8–1 in the SEC) record, with the one loss coming to the Auburn Tigers. After clinching the SEC East, the Gators won the SEC Championship Game on December 2 over Arkansas by a score of 38–28. The Gators defeated the Ohio State Buckeyes, 41–14, in the 2007 BCS National Championship Game to win the national championship. It was the first BCS bowl berth for the Gators since the Orange Bowl that capped off the 2001 campaign, and Florida's first national championship appearance and victory since winning the 1997 Sugar Bowl. Meyer has been known for winning big games. In addition to his 5–1 record in bowl games at Florida, Meyer compiled a 16–2 record against three of the Gators' biggest opponents—Tennessee, Georgia, and Florida State. The Gators managed a 9–3 regular season record in 2007, including blowout wins over rivals Tennessee and FSU but once again losing to Auburn. During his tenure at the University of Florida, Coach Meyer never defeated Auburn. Quarterback Tim Tebow also became Coach Meyer's first Heisman Trophy winner. The team led the conference in scoring, but struggles on defense made it difficult for the Gators to reach a BCS bowl game. The Gators lost the Capital One Bowl to Michigan 41–35 on January 1, 2008. Meyer served as a pre-game and halftime analyst for the 2008 BCS National Championship Game. 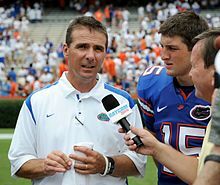 Florida Gators coach Urban Meyer and quarterback Tim Tebow being interviewed following the Gators' August 30, 2008 victory over the Hawaii Warriors. In 2008, Meyer led the Gators to a 13–1 overall record and the BCS National Championship over Oklahoma, including wins over six ranked teams. The team's lone defeat came at the hands of Ole Miss on September 27, 2008, a game in which Florida led in time of possession and passing yards, but had three turnovers. Eleven of the Gators' twelve wins in the 2008 regular season were by 20 points or more. On December 6, 2008, Meyer led the Gators to a 31–20 victory over then top-ranked Alabama in the SEC title game. Leading in time of possession, rushing yards, and passing yards, the Gators rallied from behind after a third quarter deficit to score two touchdowns and hold Alabama scoreless in the fourth quarter. The victory would vault Florida to No. 1 in the Associated Press Poll, No. 2 in the USA Today Coaches' Poll, and No. 2 in the BCS rankings, setting up a showdown against Oklahoma in the BCS Championship Game on January 8, 2009, at Dolphin Stadium in Miami, Florida. The Gators won 24–14, securing their second national championship under Meyer. In 2009, Meyer's Gators began the season ranked No. 1 by the largest margin in the history of the AP preseason poll. Though the team struggled on offense at times and quarterback Tim Tebow suffered a frightening concussion in a September victory over Kentucky, Florida finished the regular season 12–0 and still ranked No. 1. The winning streak ended in the SEC Championship Game, when they lost 32–13 to Alabama. Florida was selected to play the undefeated Cincinnati Bearcats in the 2010 Sugar Bowl. The Gators won 51–24 to finish the season with a 13–1 record for the second consecutive year. In the early morning of December 6, 2009, soon after returning home following his team's loss in the 2009 SEC Championship Game, Meyer was quietly admitted into a Gainesville hospital suffering from chest pains and dehydration. He was released later in the day, and the incident was not announced to the public at the time. On December 26, after discussions with his family, Meyer revealed his medical scare and announced that he would resign as Florida's head coach due to health and family concerns following his team's New Years Day Sugar Bowl appearance. Meyer stated: "I have ignored my health for years, but recent developments have forced me to re-evaluate my priorities of faith and family." He also said: "I'm proud to be a part of the Gainesville community and the Gator Nation and I plan to remain in Gainesville and involved with the University of Florida." Meyer admitted that he had suffered frequent chest pains, later discovered to be caused by Gastroesophageal reflux disease (GERD), and occasional severe headaches due to an arachnoid cyst for years, and that they were related to stress. On December 27, Meyer announced that he would take an indefinite leave of absence instead of resigning. He was unsure if he would return for the 2010 season but stated that, "I do in my gut believe that will happen." Offensive coordinator Steve Addazio would serve as the interim coach in Meyer's absence. On January 1, 2010, Meyer coached the Gators in their 51–24 Sugar Bowl victory over the Cincinnati Bearcats. In a post-game interview, Meyer again suggested that he would return to coach the Gators at some point by saying: "I plan on being the coach of the Gators." Meyer took significant time off from his coaching duties after the bowl game in an attempt to improve his personal health. While he did stay in touch with potential new players during the busy recruiting season, Meyer did much less traveling to visit recruits than usual. Nevertheless, the Gators still signed the consensus No. 1 recruiting class in the nation in February. On March 17, 2010, Meyer returned full-time to his position for the start of the Gators' spring practice and continued in that role into the 2010 season. With his victory over Kentucky on September 25, 2010, Meyer achieved his 100th career win as a coach. With that win, his record was at 100–18 over the course of 10 seasons. He became the sixth fastest NCAA coach to reach that record, following Gil Dobie (108 games), George Woodruff (109 games), Bud Wilkinson (111 games), Fielding Yost (114 games), and Knute Rockne (117 games). He was also the second-fastest to reach 100 wins since Wilkinson in 1945. Despite reaching this milestone, the season was a difficult one for the Gators, and their 7–5 regular season record was the worst in Meyer's tenure at Florida. On December 8, 2010, Meyer again announced his retirement from coaching for much the same reasons he mentioned in December 2009: his family and his health. Meyer's last game as Florida's coach was a 37–24 win in the 2011 Outback Bowl on January 1, 2011. After resigning as the head football coach of the Florida Gators, Meyer worked as a college football commentator and analyst for the American television sports network ESPN. On November 17, 2011, Eleven Warriors reported that Meyer would become the head coach of the Ohio State Buckeyes. Meyer denied the report publicly. Meyer then asked ESPN to be taken off assignment during the weekend of the Ohio State–Michigan game, adding more to the speculations that he might be named the next head coach of Ohio State. On November 28, WBNS Columbus confirmed that Meyer had accepted the job as Ohio State's head football coach, and was introduced as head coach later that night. The school said Meyer would receive a six-year contract that pays $4 million annually, plus another $2.4 million total in "retention payments." It was reported by CBSSports on April 13, 2015 that Meyer signed a contract extension with the Buckeyes through 2020. In Meyer's first year of coaching at Ohio State, he helped lead the Buckeyes to an undefeated 12-0 record and a No. 3 AP Poll ranking. The team was ineligible for all other rankings, as well as postseason play, due to NCAA sanctions. He was surrounded by first-year coaches such as offensive coordinator Tom Herman, co-offensive coordinator Ed Warriner, and co-defensive coordinator Everett Withers. Meyer's next year was not as good as the last, but still Ohio State was #12 in the BCS rankings and a 12-2 record. Meyer lost talent at the end of the year to the 2014 NFL Draft, including linebacker Ryan Shazier, cornerback Bradley Roby, and running back Carlos Hyde. Roby and Shazier went in the first round, and Hyde went in the second round. Dublin, Ohio, the city in which Urban Meyer resides, renamed West Bridge Street in his honor for his accomplishments during the 2014 season. Before the start of the season, Ohio State lost its star quarterback, Braxton Miller, when he sustained a right shoulder injury during a practice. Redshirt freshman quarterback J. T. Barrett stepped in as his replacement and led Ohio State to an 11–1 record though the first 12 games of the season. However, in the final game of the regular season, he sustained a broken ankle and was lost for the remainder of the year. Cardale Jones replaced Barrett at quarterback and guided Ohio State to 59–0 blowout win over Wisconsin in the Big Ten Football Championship Game. With the conference championship and the convincing win over Wisconsin, Ohio State moved up to #4 in the College Football Playoff rankings, jumping the two Big 12 teams in playoff contention, Baylor and TCU, qualifying for the inaugural four-team postseason tournament. They played #1 Alabama in the semifinal Sugar Bowl. Despite being nine-point underdogs and trailing by as much as 15 points in the first half, Ohio State came back to win, 42–35. The Buckeyes then faced Heisman Trophy winner Marcus Mariota and the Oregon Ducks in the College Football Playoff National Championship. The Buckeyes were again underdogs as the #2-ranked Ducks were favored by seven points. Despite giving up four turnovers, Ohio State beat Oregon, 42–20, with MVP performances from running back Ezekiel Elliott and safety Tyvis Powell. The victory marked the eighth national championship in Ohio State's history and gave Meyer his third career national title, following his two with Florida. On August 1, 2018, Meyer was placed on paid administrative leave by Ohio State, after reports surfaced that Meyer knew about spousal abuse allegations against assistant coach Zach Smith prior to Smith's firing the week prior. After an independent investigative panel reviewed the evidence, the Ohio State Board of Trustees found that Meyer and Ohio State University Athletic Director Gene Smith did not uphold the values of the university. On August 22, the board voted to suspend Meyer for the opening three games of the season for the Buckeyes. He missed the team's games against Oregon State, Rutgers, and TCU. Ohio State finished the year with a 12–1 record, including winning the Big Ten conference, but was not selected for the College Football Playoff, instead receiving a spot in the 2019 Rose Bowl. On December 4, 2018, Urban Meyer announced that he would retire from coaching following the team's Rose Bowl game, due to health reasons. It was announced that Ryan Day would take over the head coaching position immediately after the Rose Bowl. When Meyer got his first head coaching position at Bowling Green, he took trips to visit John L. Smith and Scott Linehan at Louisville, Randy Walker and Kevin Wilson at Northwestern, Bill Snyder at Kansas State, Joe Tiller and Jim Chaney at Purdue, and Rich Rodriguez at West Virginia, all of whom ran some version of the spread offense. Meyer's teams at Bowling Green, Utah, Florida, and Ohio State all ran the spread, chiefly utilizing a run-first variation most similar to Rich Rodriguez's formerly at West Virginia with tweaks to fit the offensive personnel, for example Meyer's first two years at Florida skewed toward a drop-back passing attack led by Chris Leak, while Tim Tebow led an option run-based spread (as did Alex Smith at Utah). Using this offense, he has won two BCS titles, won the inaugural College Football Playoff National Championship, has become the first coach to lead a BCS non-AQ conference team (Utah) to a BCS bowl, has coached a Heisman trophy winner (Tim Tebow), and has graduated a player who became a number one overall pick in the NFL draft (Alex Smith). While studying at Cincinnati, Meyer met Shelley Mather Meyer, a freshman nursing student, at Sigma Chi's Derby Days philanthropy event and they married in 1986. The Meyers have three children: Nicole ("Nicki"), Gisela ("Gigi") and Nathan ("Nate"). His two daughters played Division I volleyball: Nicki played for Georgia Tech and Gigi played for Florida Gulf Coast. He is a practicing Roman Catholic. Meyer resides in Dublin, Ohio. In October 2008, coach Urban Meyer and University of Florida head basketball coach Billy Donovan were named co-chairmen of an effort to raise $50 million to support the Florida Opportunity Scholars Program. This scholarship was designed for first-generation students that have unique needs and financial challenges. The Florida Opportunity Scholars Program was created by President Bernie Machen in 2006, and is intended to increase the opportunities for academically prepared first-generation students. In December 2008, Meyer and Utah football head coach Kyle Whittingham were the first people to donate money to the Elder Joseph B. Wirthlin Family Scholarship, an endowed scholarship which will benefit the Utah football program. ^ a b In 2012, Ohio State was ineligible for the Big Ten Conference title, postseason play, and the Coaches Poll. ^ a b Meyer was placed on administrative leave for the first three games of the 2018 season. Ryan Day served as acting head coach in his absence and is the coach of record for those three games. Under Day, the Buckeyes won all three contests, one of which was a conference game. Ohio State finished the with a record of 13–1 and conference mark of 8–1. ^ a b "Urban Meyer stepping down at Florida," ESPN (December 8, 2010. Retrieved December 8, 2010. ^ Thamel, Pete (December 4, 2018). "Sources: Urban Meyer to step down as Ohio State head coach after Rose Bowl". sports.yahoo.com. Yahoo! Sports. Retrieved December 4, 2018. ^ "College football: Highlights and lowlights of the decade," Sports Illustrated (December 17, 2009). Retrieved March 19, 2010. ^ "Ezekiel Elliott's 4 TDs lift Ohio State to inaugural CFP title over Oregon," ' 'ESPN' ' (January 13, 2015). Retrieved January 13, 2015. ^ "Ohio State decision on Urban Meyer hiring remains hot issue," The Sporting News (November 27, 2011). Retrieved December 5, 2011. ^ Matt Markey, "Coach Meyer returns to roots: Ohio native is 24th coach of Buckeyes," The Toledo Blade (November 29, 2011). Retrieved December 5, 2011. ^ Tom Archdeacon, "Urban Meyer — A Buckeye through and through," Dayton Daily News (November 28, 2011). Retrieved December 5, 2011. ^ "Ohio State bucks tradition with Urban Meyer hire," The Lantern (November 30, 2011). Retrieved December 5, 2011. ^ Mark Podolski, "Hometown of Urban Meyer celebrates," The News-Herald (November 29, 2011). Retrieved December 5, 2011. ^ Bowman, Mark (December 30, 2016). "Baseball was Meyer's first love". MLB.com. Retrieved December 31, 2016. ^ a b "Urban Meyer: A career timeline from Ashtabula to the Ohio State Buckeyes". The Plain Dealer. November 23, 2011. Retrieved December 31, 2016. ^ a b Raymond Hines III, "Denise Meyer Chat Transcript Archived February 18, 2007, at the Wayback Machine," Gator Country (October 25, 2006). Retrieved September 1, 2009. ^ a b c d e f Gatorzone.com, Football, Urban Meyer Archived May 23, 2009, at the Wayback Machine. Retrieved September 1, 2009. ^ a b c College Football Data Warehouse, All-Time Coaching Records, Urban Meyer Records by Year. Retrieved September 2, 2009. ^ Associated Press, "Meyer, Stoops taking fast track to greatness," SI.com (January 1, 2009). Retrieved September 1, 2009. By winning the 2009 BCS Championship game on January 8, 2009, Meyer moved past Oklahoma head coach Bob Stoops into second place on the list of active Division I coaches ranked by winning percentage. ^ Mark Schlabach, "Determined Meyer elevated Gators," ESPN.com (December 26, 2009). Retrieved February 12, 2010. ^ Peter Kerasotis, "Notre Dame, Meyer seem like perfect fit," Florida Today (November 20, 2008). Retrieved September 1, 2009. ^ Pat Dooley, "Urban Meyer: 'I'm not going to Notre Dame. Ever.'" Gainesville Sun (July 13, 2009). Retrieved September 1, 2009. ^ a b Gatorzone.com, "UF's Urban Meyer Steps Down as Head Football Coach Archived January 2, 2010, at the Wayback Machine," (December 27, 2009). Retrieved March 19, 2010. ^ Andy Staples, "Florida's Urban Meyer taking indefinite leave, not resigning," Sports Illustrated (December 27, 2009). Retrieved March 19, 2010. ^ Kyle Maistri, "First spring practice, Urban Meyer feeling 'fine,' ready to work on improving team," Palm Beach Post (March 17, 2010). Retrieved March 19, 2010. ^ Martin, Urban's Way, p. 66. ^ "Bobby Brown". College Football at Sports-Reference.com. ^ "2000 Notre Dame Fighting Irish". College Football at Sports-Reference.com. ^ "Nick Saban and Urban Meyer made the best of a 25-year-old oversight". USA TODAY. December 30, 2014. ^ a b College Football Data Warehouse, Bowling Green Yearly Results: 2000–2004. Retrieved September 2, 2009. ^ Liz Abel, "Utah hires Urban Meyer as its new head coach," press release, University of Utah News Center (December 12, 2002). Retrieved September 1, 2009. ^ a b Utah Football, Player Bio: Urban Meyer Archived January 1, 2009, at the Wayback Machine. Retrieved September 1, 2009. ^ Matt Hayes, "Coach of the year: Urban Meyer, Utah," Sporting News (December 15, 2003). Retrieved September 2, 2009. ^ Kelley King, "Wild out West: Running mad in Urban Meyer's radical spread-option attack," Sports Illustrated (November 1, 2004). Retrieved September 1, 2009. ^ a b c d Chris Brown, "The Florida Gator/Urban Meyer Offense," SmartFootball.com (December 2, 2008). Retrieved September 1, 2009. ^ Associated Press, "Efficient Smith leads dominant win," ESPN.com (January 1, 2005). September 1, 2009. ^ College Football Data Warehouse, Utah Yearly Totals. Retrieved September 13, 2009. ^ a b Ivan Maisel, "Notre Dame football exists only in history books," ESPN.com (December 6, 2004). Retrieved September 2, 2009. ^ "Bonuses become bonanza for Urban Meyer, Bob Stoops," Seattle Times (December 25, 2008). Retrieved September 2, 2009. ^ Chris Low, "New deal in hand, Meyer is staying put at Florida," ESPN.com (August 3, 2009). Retrieved September 2, 2009. ^ Andy Staples, "Meyer deal proves recession hasn't hurt big-time college programs," Sports Illustrated (August 3, 2009). Retrieved September 2, 2009. ^ a b c Rachel George, "Chris Rainey 30th player to be arrested or face charges during Urban Meyer's tenure," The Sun-Sentinel (September 15, 2010). Retrieved September 15, 2010. ^ a b c Greg Bishop, "Hernandez Among Many Who Found Trouble at Florida in the Meyer Years," The New York Times (July 6, 2013). Retrieved July 7, 2013. ^ Associated Press, "College: Former USC star Reggie Bush says forfeiture of Heisman Trophy isn't admission of guilt," Contra Costa Times (September 16, 2010). Retrieved September 17, 2010. ^ "Urban Meyer says 'enough's enough' in regards to Florida football player arrests Total of 25 players that faced charges upsetting to Florida coach Urban Meyer – Orlando Sentinel". Articles.orlandosentinel.com. September 17, 2010. Retrieved September 26, 2010. ^ Associated Press, "South Carolina derails Gators' SEC East hopes," ESPN.com (November 12, 2005). Retrieved January 1, 2009. ^ a b Associated Press, "Gators attack: Florida gets title with rout of Ohio State," ESPN.con (January 8, 2007). Retrieved September 1, 2009. ^ College Football Data Warehouse, Florida Bowl History. Retrieved September 1, 2009. ^ a b College Football Data Warehouse, All-Time Coaching Records, Urban Meyer:2007. Retrieved September 1, 2009. ^ SECSports.com, 2007 SEC Football Leaders. Retrieved September 1, 2009. ^ Mark Schlabach, "Gators to alter style of play with loss of nine defensive starters," ESPN.com (August 7, 2007). Retrieved September 1, 2009. ^ a b "Florida: Meyer dehydrated after loss". Retrieved December 27, 2009. ^ ESPN.com News Services, "Meyer to coach final game at Sugar Bowl." Retrieved December 26, 2009. ^ Thamel, Pete (December 28, 2009). "Florida's Meyer Will Take Leave, Not Resign". The New York Times. Retrieved December 27, 2009. ^ "Tebow caps college career with 533 yards, Sugar Bowl romp". Retrieved January 2, 2010. ^ Dennis DoddCBSSports.com Senior Writer. "Meyer's intensity has made Gators best of best – NCAA Football". CBSSports.com. Archived from the original on October 13, 2012. Retrieved August 5, 2010. ^ "Florida's Meyer may not take leave of absence – College football". nbcsports.msnbc.com. January 23, 2010. Archived from the original on January 25, 2010. Retrieved August 5, 2010. ^ "Meyer: Workload has been the same". Retrieved January 24, 2010. ^ "College Football Class Rankings 2010". ESPN. Retrieved August 5, 2010. ^ "Top 10 football recruiting storylines of 2010 class – CFB News – FOX Sports on MSN". Msn.foxsports.com. February 8, 2010. Archived from the original on July 12, 2010. Retrieved August 5, 2010. ^ Low, Chris (May 8, 2010). "Florida may have best recruiting class ever". ESPN. Retrieved August 5, 2010. ^ Carey, Jack (August 2, 2010). "Meyer carries Florida to No. 1 recruiting class". USA Today. Retrieved May 8, 2010. ^ "Urban Meyer ends leave of absence, returns for UF's first practice – Andy Staples". Sports Illustrated. March 17, 2010. Retrieved May 8, 2010. ^ St. Petersburg Times,  Archived October 13, 2012, at the Wayback Machine. Retrieved September 26, 2010. ^ Brennan, Christine (December 9, 2010). "Family is an understandable pull for Florida's Urban Meyer". USA Today. ^ "Meyer tweaks UF legacy, but what a legacy it is". Gatorsports.com. Archived from the original on January 5, 2011. Retrieved January 1, 2011. ^ Eleven Warriors [@11W] (November 18, 2011). "We are 99.7% sure Urban Meyer has agreed to a deal to become the next coach of Ohio State. Solid sources. Plural" (Tweet) – via Twitter. ^ "Urban Meyer: No Buckeyes deal," ESPN.com (November 23, 2011). Retrieved November 23, 2011. ^ "Meyer asks off ESPN duties amid Ohio St. rumors". CNN. November 25, 2011. ^ "Urban Meyer to Ohio State: Football Coach Hired By Buckeyes". Huffington Post. November 28, 2011. Archived from the original on October 31, 2013. Retrieved November 28, 2011. ^ Fornelli, Tom (April 13, 2015). "Ohio State extends Urban Meyer's contract through 2020 season". CBSSports.com. Retrieved April 13, 2015. ^ "Poll position: OSU ineligible for ranking". ESPN.com. ^ "Photo: Urban Meyer gets his 'Way' in Dublin". The Columbus Dispatch. January 22, 2015. Archived from the original on March 20, 2015. ^ ""Ohio State's Meyer put on leave, investigation opened"". Associated Press. August 1, 2018. ^ Associated Press, "Utah coach lauded for perfect season," ESPN.com (January 2, 2005). Retrieved September 5, 2009. ^ Associated Press, "Florida QB Tebow is the first underclassman to win Heisman," ESPN.Com (December 9, 2007). Retrieved September 5, 2009. ^ National Football League, Draft History, 2005 Round 1. Retrieved September 5, 2009. ^ Ken Sugiuera, "Daughter of Florida’s Meyer to play for Jackets," Atlanta Journal Constitution (November 18, 2008). Retrieved September 1, 2009. ^ Caldwell, Dana (August 25, 2011). "Volleyball: FGCU standing tall as new season begins". naplenews.com. Archived from the original on April 3, 2012. Retrieved August 26, 2011. ^ Pete Kerasotis (November 20, 2008). "Notre Dame, Meyer seem like perfect fit". Florida Today. Archived from the original on December 16, 2010. Retrieved October 15, 2011. ^ "OSU football coach Urban Meyer, wife buy home in Muirfield". dispatch.com. March 21, 2012. ^ University of Florida Foundation, Florida Opportunity Scholars, Billy and Urban's Challenge. Retrieved September 1, 2009. ^ Nathan Crabbe, "Will Meyer donate big payday to UF scholarship fund?" Gainesville Sun (January 7, 2009). Retrieved September 1, 2009. ^ University of Florida, Student Affairs, Florida Opportunity Scholars Archived July 23, 2008, at the Wayback Machine. Retrieved September 1, 2009. ^ "Billy Donovan and Urban Meyer Co-Chair Drive to Raise Scholarship Funds Archived February 23, 2012, at the Wayback Machine," GatorZone.com (October 14, 2008). Retrieved September 1, 2009. ^ "U. Athletics Establishes Joseph B. Wirthlin Scholarship: Kyle Whittingham, Urban Meyer are first contributors Archived March 8, 2009, at the Wayback Machine," Utah Football (December 18, 2008). Retrieved September 1, 2009. ^ Lee Benson, "Elder Wirthlin's goodness now a legacy at U.," Deseret News (January 16, 2009). Retrieved September 1, 2009. ^ "2013 MAC Football Media Guide (.pdf)" (PDF). Mid-American Conference. 2013. Retrieved December 18, 2013. BGSU Football History, 2006 Bowling Green Football Media Guide. Ute Record Book, 2006 Utah Football Media Guide. Head Football Coach Urban Meyer, 2006 Gator Football Media Guide. Thompson, Wright (August 20, 2012). "Urban Meyer will be home for dinner". ESPN The Magazine. Bristol, Connecticut: ESPN. Wikimedia Commons has media related to Urban Meyer.